This little guy was so fun to watch. I heard some one making a lot of noise. Finally, I found him. He had so much to say and was very loud. He is quite the character and made so many "faces". I followed him around for awhile, so he will most likely be showing up more in the coming days. Thanks for your comments on my pineapples yesterday and getting both on TP&PP ! Truly appreciate you taking the time to stop by. really gorgeous. He has rather a large beak for such a little fellow and really does look like someone with a lot to say. Well caught and captioned. Glad you tracked him down. Sweet capture and great focus. Stunning capture of this little beauty! He is so lovely! Gorgeous image. Oh my...what a long beak you have! Fav. Stunning shots of this beautiful little bird with lovely detail, fav! wow two that are so perfect in a row, I do like the action of the mouth in this! He looks like a tough one. 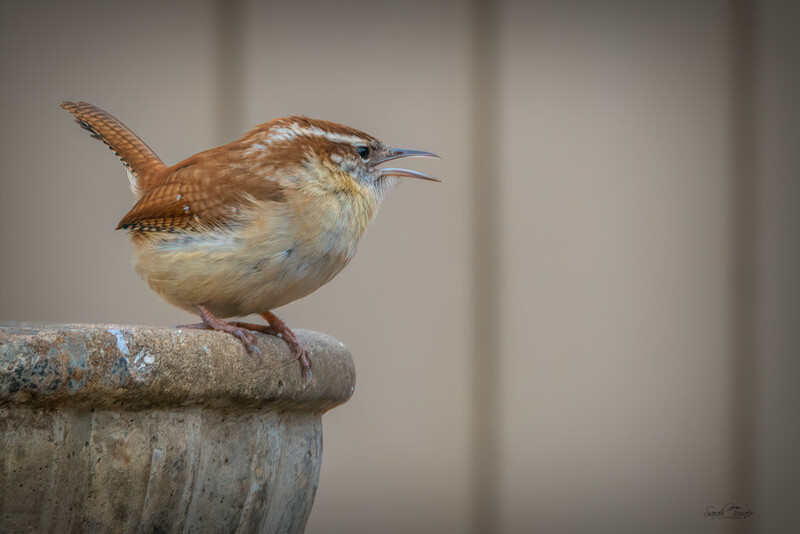 I find wrens hard to spot and am amazed that you managed to get a shot as they are very quick to move around. Lovely. A gem of a shot! What a cutie! Perfect capture!